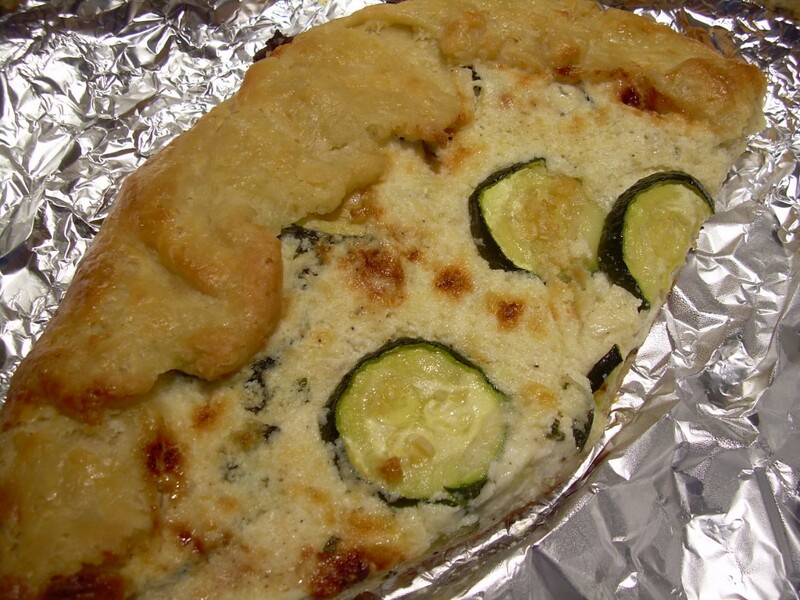 continue reading "Zucchini and Ricotta Galette"
I confess: in some ways, my palate has the sophistication of a five year old. And macaroni and cheese is one of those ways. I didn’t grow up with the Kraft “blue box,” but on the rare occasions that my folks would go out, my brother and I would get to eat Stouffer’s frozen mac and cheese TV dinners. Woo-hoo! Good times. But the one thing that commercial mac and cheeses do not have is a crunchy, buttery topping. That’s where this recipe comes in, my adaptation of Cook’s Country Best Potluck Macaroni and Cheese, which allowed me to use up little bits and pieces of challah and ciabatta lurking about my freezer. Oh, and one Trader Joe’s whole wheat hamburger bun, age unknown. But once you pulse these chunks of bread in a food processor, along with some butter and parmesan cheese, then bake it atop a mac and cheese casserole, you end up with quintessential comfort food. And seeing as I now have to get a new dishwasher (along with the washer, refrigerator, microwave oven, and oven that have broken down this year), I need some comforting. My favorite mac and cheese is still the frozen kind, but my husband, who is not a connoisseur of this dish, found it pretty tasty. And we both loved the crumb topping. Recipe after the jump. And this recipe has been YeastSpotted! 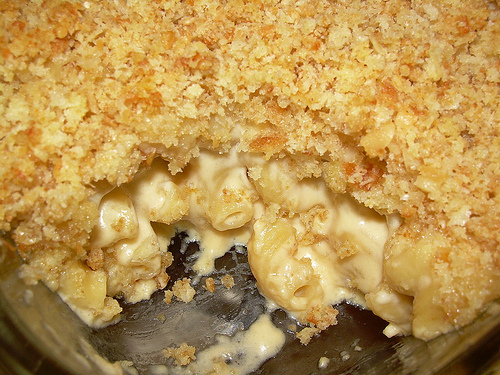 continue reading "Another Way to Use Leftover Bread: Mac and Cheese with Buttery Crumb Topping"
Posted by Madam Chow Published in cheese, tart, vegetable, You Want Pies With That? This month, for You Want Pies with That?, Jenn of Piccante Dolce asked us to bake a pie that was inspired by a vacation we’ve taken or hope to take. That was easy: Nice, France. On some travel or food show a few years ago, I saw pictures of the sun drenched Mediterranean, azure waters, and markets overflowing with beautiful produce. So, I slow roasted some Roma tomatoes in the oven after tossing them with olive oil, oregano, salt, and pepper. 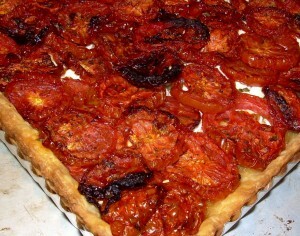 Then I layered them on top of crumbled goat cheese and fresh basil, all nestled in a savory butter crust. How did it turn out? A lot better than that awful picture! My husband and I (well, mostly me) almost ate the whole thing in one sitting. Definitely on the repeat list. 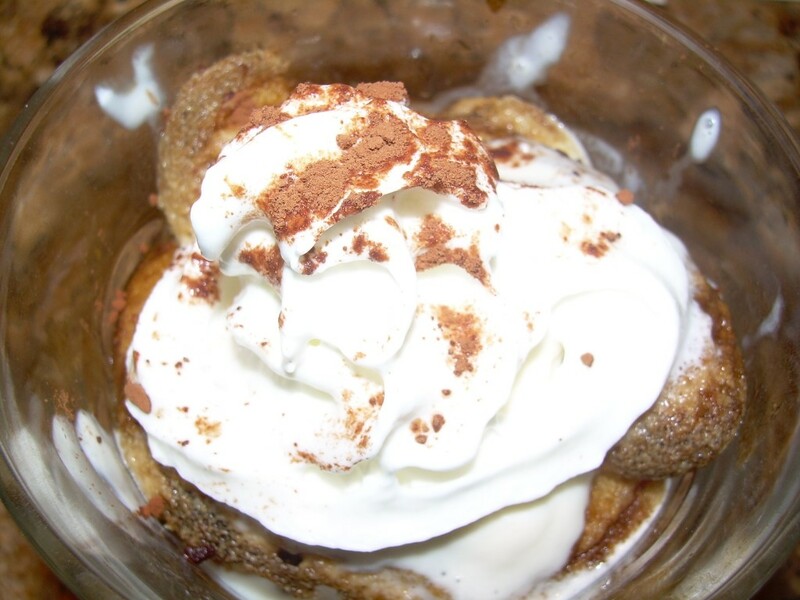 Be sure to see what pies others came up with this month at the Pies with That blogroll! In the movie “Top Gun,” there’s that famous line: “I feel the need, the need for speed!” Well, in my case, I’ve been feeling the need for yeast. So, this month’s Bread Baking Day provided just the excuse I needed to whip something up, particularly since the topic is bread with cheese. Yum. Specifically, Bread with Cheese hosted by High on the Hog. I turned to a recipe that I had bookmarked over at King Arthur Flour’s baking blog, and substituted parmigiano reggiano for the Asiago cheese called for in the recipe. 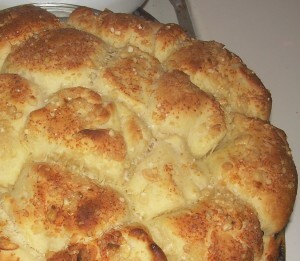 I think Asiago is an Italian cheese, so I don’t have a clue why this is called “French” Asiago Bubble bread. I tweaked the recipe a bit since I don’t have a bread machine, and in a remarkably short period of time, had these warm, flavorful little cheesy nuggets sitting on my counter. I should say, on the counter in my smoke-filled kitchen. Why? I forgot to put the pan on a baking sheet, and as the bread rose in the oven, the olive oil overflowed and burned, leaving me gasping and gagging for fresh air. Don’t believe me? 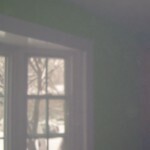 Here’s a picture to the right, proving yet again that I make the mistakes so you don’t have to! One other thing that I did was to mince the garlic instead of crushing it – I thought that would reduce the chance of burned garlic, and I was right. Use a strong cheese for this – your wimpy parmesan in a green can will not provide the flavor punch needed to have a tasty bread. 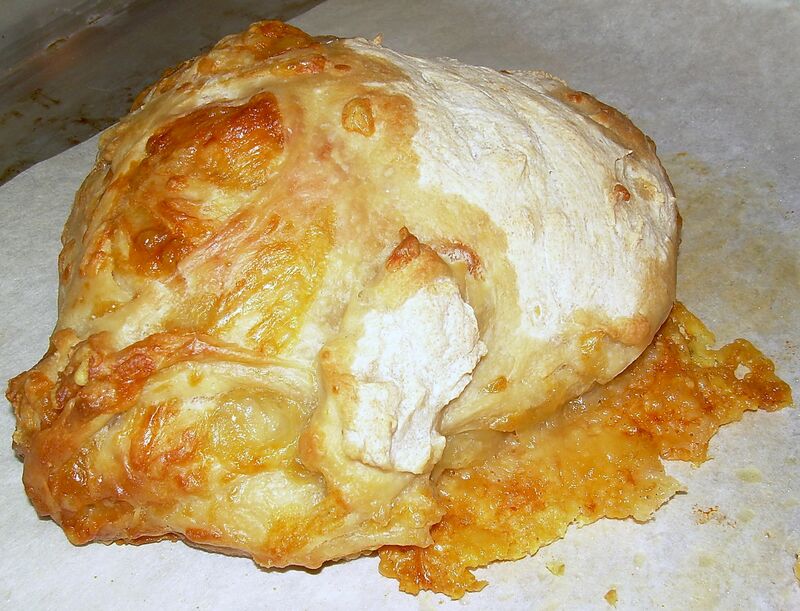 The end result is a flavorful, doughy bread with a slightly crisp crust. 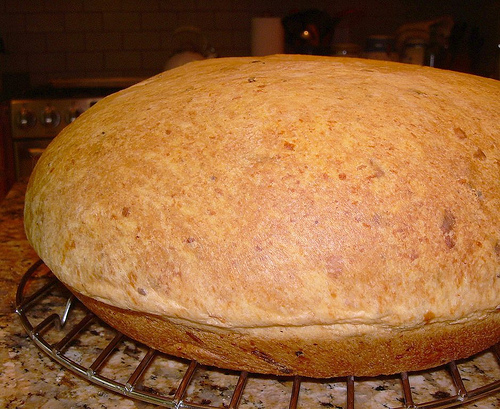 This is not a fluffy bread, but it’s not really dense, either. This is my submission for Bread Baking Day. I also recommend that every Friday (and heck, every other day, too) you wander over to Susan’s wonderful blog to check out her weekly roundup called YeastSpotting. Happy yeasty baking, everybody! Recipe after the jump . . . .
continue reading "French Asiago Bubble Bread for Bread Baking Day"
Master Chow and I don’t buy iceberg lettuce, opting for greens with more nutritional bang for the buck. 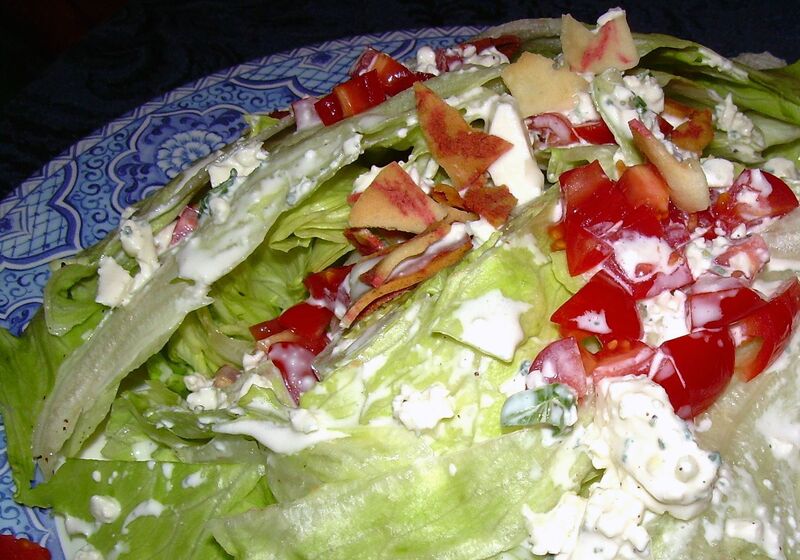 But about five or six years ago, I ordered and iceberg lettuce wedge with blue cheese dressing in a restaurant, and became a fan. I love the dish, but rarely order it, and had never made. I decided to remedy that on New Year’s Day, and Master Chow thoroughly enjoyed it, too. Apparently, it went well with the prime rib and popovers that I made for dinner (more on those in future posts). I turned to Deb’s recipe over at Smitten Kitchen. I used some gorgonzola cheese that I had on hand, and substituted . . . are you ready? . . . soy bacon for the regular stuff. Master Chow, aka He Who Loves Pork, was delightfully surprised at the result, and announced that the soy bacon worked well in the dish. Hooray! I also didn’t have any chives on hand, so I thinly sliced some scallion greens. Some thoughts: I will definitely be making this dressing again, and will try it on our usual fare of romaine lettuce. If you like a thick dressing, this is not the one to try without adjustments – this is a thin, flavorful dressing with a lot of depth to it. A while back, I bought come extra sharp cheddar cheese at our local Costco. All I have to say about the “extra sharp” adjective is – HA! FAT CHANCE! It was about as sharp as a baseball. Needless to say, I can’t stand wasting food, so I had to find a way to use it up. 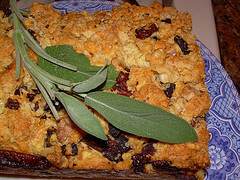 First up, Bacon Cheddar Quick Bread with Dried Pears, (by Dorie Greenspan in the October 2008 issue of Bon Appetit). Yes, I made something out of the magazine, even though I’ve been very disappointed with the change in format this year. For me, the biggest strike against the magazine is the microscopic, hard-to-read font that they’ve been using. A few months ago, I counted five different fonts on one page alone, and finally gave up. And, I’m not alone in my disappointment over the changes in a much-loved magazine. I really appreciate Bon Appetit trying to keep things fresh and interesting, but I think they went a bit too far. Now that I’ve got that out of my system (thanks for listening), what can I say about this quickbread recipe from dear Dorie? Pros: good texture and great idea. 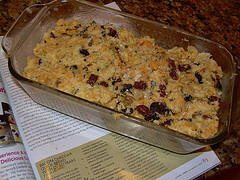 I will try it again, but I will tweak the recipe. Dorie offers some great alternate flavoring suggestions. Cons: the flavor. I hated the bacon and the sage, and I used a quality bacon from Whole Foods, and I usually like sage. The aforementioned cheddar was completely indiscernible. 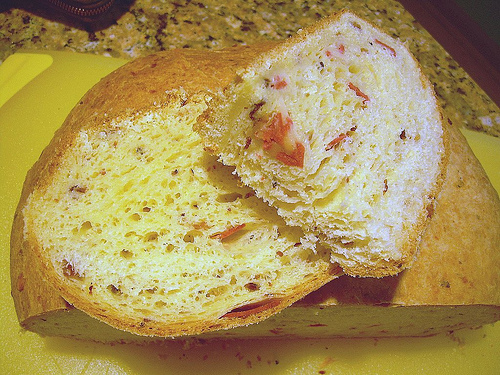 Neither Master Chow nor I would eat more than a slice of this bread (and I picked all the bacon out of mine), so it sits in my freezer. If you decide to make it (and Brilynn had great results, so don’t be afraid), use a really, really sharp cheddar. The kind that will put hair on your chest. What I will do differently in the future: no sage or bacon. 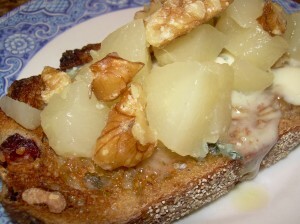 I will use blue cheese, and increase the pears and walnuts. Did I say no sage? On to experiment number 2 – a cheese souffle made with the same shameful IMPOSTOR of an extra-sharp cheddar cheese. If you’ve never made a souffle before, you should know that it is very important to make a strongly flavored base, so that the dish actually tastes like something once it has been mixed with the egg whites, and baked. I got to work and doctored this recipe from Food and Wine by adding both anchovy paste and sundried tomato paste, since I didn’t have gruyere (nooooo, I had a crappy cheddar). Voilá! 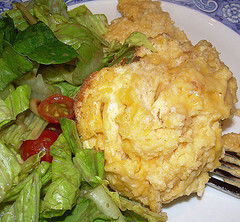 A pretty good cheddar cheese souffle and, unlike the savory bread, Master Chow had several servings of this, as did I. If you used a really good flavorful cheddar, this would be excellent. 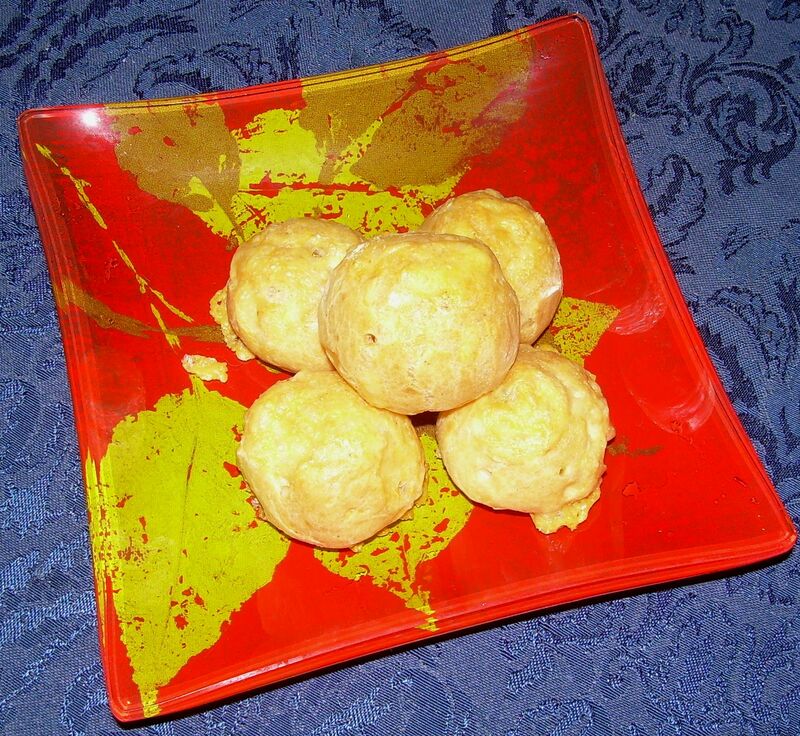 Recipe after the jump . . . .
continue reading "A Cheddar Cheese Tale"
Back in May, a group of wild and crazy gals decided to bake some cheesy rolls from King Arthur Flour’s Bakers Banter blog. The bread looked amazing, so I bookmarked it, and finally had the opportunity to bake it. 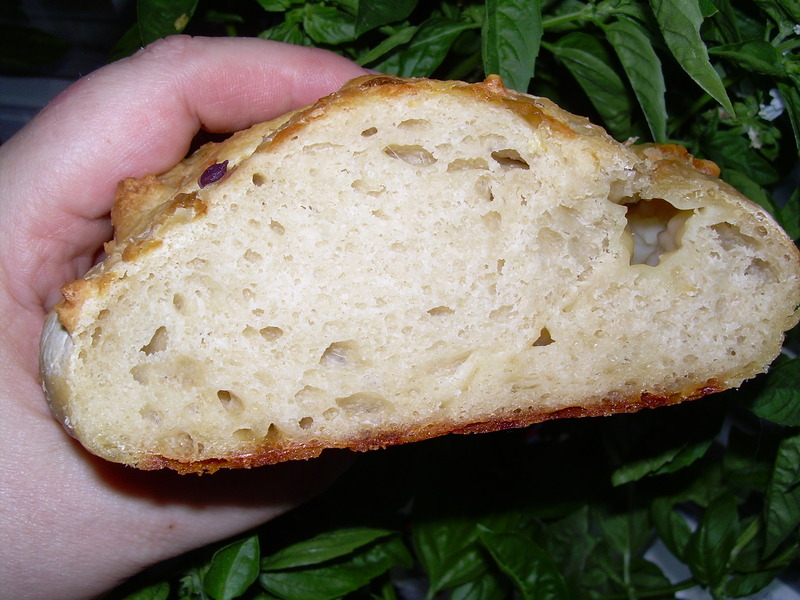 I may not have added enough flour or kneaded the dough long enough, because it was pretty tough to work with – incredibly sticky and very, very soft. I used Ementaler cheese instead of Gruyere (which, believe it or not, I really don’t like that much). 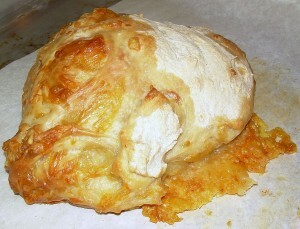 But the result was fantastic – soft interior, crispy exterior, and cheesy goodness all around. 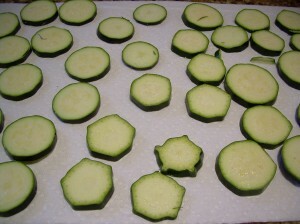 Next time, I’d like to try this with a sharp cheddar and diced green chilies. If I could give one tip, it would be to pick a strong, flavorful cheese. I’m so glad I made this, and I hope to again. And thanks to all of you out there in the blogosphere who are my constant sources of inspiration! Keep on baking! And please excuse me for the short posts the last week – I’ve been really busy, and I’m just glad I was able to get a thing or two up on my blog. I appreciate all your visits, and really look forward to your comments. And be sure to check out Susan’s YeastSpotting post every Friday to see what people have been baking!